Yesterday, we starded our next hole in a new way because this time, we want to drill until the sediment/basement interface (1450 mbsl)! Before that, we have to build a reentry system that includes 754 m of “casing”. The casing is made up of 64 pieces of pipe which will remain under the seafloor and prevent unstable upper formations (such as sand) from caving in and frapping the drill string. The hole drilled for each casing string must be large enough to fit the 10-3/4” casing inside it. To drill the casing, an underreamer will propel the drill bit down through the sediments. The underreamer has hydraulic “arms” that open and spin jets of water at the front once under pressure. In our case, the arms will made a hole that is 12-3/4” wide. What are the operations to assemble the casing? 1) The first step is to put together the casing. The crew assembles 64 stands of 10-3/4” casing (around 754 m) hanging below the ship’s moonpool. The hydraulic Release Tool (HRT) is also assembled in preparation for running the drill-in casing system. The mudskirt is waiting on the moonpool. It is a rectangular base made out of steel which will rest on the seafloor and prevent the Free Fall Funnel from sinking into the sediments. 2) During the second step, the underreamer and drill bit assembly are lowered into the casing. The underreamer is rotated by a mudmotor and will help the drill bit advance into the seafloor sediments and remove the debris. 3) Then, the moonpool is opened and the crew lowers the mudskirt with the casing attached to it and after that, drops the Free Fall Funnel, which will help us reenter the hole to start coring. The underreamer and the bit at the end of the casing will drill the sediments below the seafloor until the mudskirt settles down. When it is done, the arms of the underreamer fold in so that it can be brought back to the ship. The entire reentry system took around 10 hours to reach the seafloor. 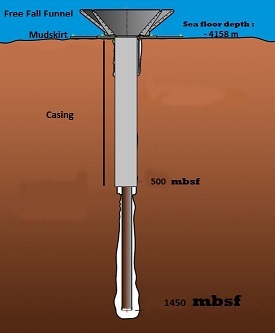 The drilling of the casing into the formation until the mudskirt, the HRT and the Free Fall Funnel settle on the seafloor will take around 36h. For now, the scientists are very patien and are waiting quietly to hear again ‘core on deck- core on deck”.